1992-07-08. New. Ships with Tracking Number! INTERNATIONAL WORLDWIDE Shipping available. Buy with confidence, excellent customer service! Little, Brown & Co.. Hardcover. 0333012496 Like New Condition. . Fine. Little, Brown & Co.. Hardcover. 0333012496 New Condition. . New. Atlantic Little Brown, 1970 Hard Cover. Very Fine/Very Fine. First Edition. A masterly biography of Jean Cocteau written 7 years after his death and lavishly furnished with illustrations and photos. 583 pages. 2003-07-05. Good. Ships with Tracking Number! INTERNATIONAL WORLDWIDE Shipping available. May not contain Access Codes or Supplements. May be ex-library. Shipping & Handling by region. Buy with confidence, excellent customer service! 1970-01-01. Good. Ships with Tracking Number! INTERNATIONAL WORLDWIDE Shipping available. May not contain Access Codes or Supplements. May be ex-library. Shipping & Handling by region. Buy with confidence, excellent customer service! David R Godine, 1992-11-01. Paperback. Used:Good. David R Godine. PAPERBACK. 087923606X New Condition. . New. Nonpareil Books. PAPERBACK. 0094671001 New Condition. . New. 1992-07-08. Good. Ships with Tracking Number! INTERNATIONAL WORLDWIDE Shipping available. May not contain Access Codes or Supplements. May be ex-library. Shipping & Handling by region. Buy with confidence, excellent customer service! Boston: Little Brown. B000NUS39M VeryGood/ acceptable DJ, Stated 1st edition, dustjacket in Mylar coating, DJ is missing top 3/4 inch of spine, 2 inch tear at front hinge, numerous short tears and a few small chips, clean text, top edge dyed light blue. (Edition:1st Edition) ...Package carefully to protect the corners. . Very Good. 1899-12-30. David R Godine. PAPERBACK. 087923606X Like New Condition. . Fine. Nonpareil Books. PAPERBACK. 0094671001 Like New Condition. . Fine. London: Macmillan, 1970. Hardcover. VG (DJ slightly worn at extremities; Some rubbing; Internally clean; Binding tight). Beige cloth over boards; Gilt titling at spine; 583 pp. ; 45 bw photos. 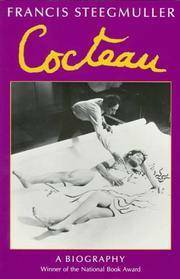 A biography of poet, novelist, playwright, artist, and filmmaker Jean Cocteau based on years of research and countless interviews with friends and acquaintances. Boston and Toronto: Little, Brown & Company, and Atlantic Monthly Press, 1970. 8vo. Illus. First trade edition, first issue. Publisher's cloth. Waterstain to top edge.Very good condition, no dust jacket. Macmillan, 1970. 583 pp. Dustjacket is chipped and torn on the edges with two tears on the rear. Browning to page edges.. First Edition. Hardcover with Dustjacket. Very Good/Fair. 8vo. Boston: Little, Brown & Co., c1970. 1st edition . Hardcover. Very good condition chipped d.j./fair. 583p., illus. Condition: Very good condition chipped d.j. Boston: Nonpareil Books, 1992. Paperback Small Quarto. Paperback. Good. wraps, 591 pp. London and Basingstoke: MacMillan, 1970 The dust jacket has minor wear with somewhat spotted inside flaps. The center and bottom edges of the book have light spotting. 583 pages.. Hard Cover. Very Good/Very Good. Size F: 9"-10" Tall (228-254mm). Boston: Little Brown, 1970. First. hardcover. fine/fine. Illustrated. 583pp., 8vo, cloth, d.w.. Boston: Little, Brown and Company, (1970). First edition. London: MacMillan, 1970. First Edition, First Impression. Cloth Bound Boards. Very Good/Good. 8vo - over 7¾" - 9¾" tall. 1970 first edition, first impression. Size large thick octavo, 583 pages. Beige cloth covered boards with gilt titles on black panel to the spine, green end-papers, with the dust jacket. Book condition very good, corners and spine ends bumped, top and bottom edges of covers a little dust darkened, pages are slightly toned otherwise clean throughout. Dust jacket condition good, edges are curled with minor creases and a couple of small tears, slightly age toned, spine slightly sunned, price clipped. London: Macmillan, 1970. Gold title on brown cloth boards which has just a touch of wear to spine head. Internally there are some minor marks to lower closed edge else very clean, tight and unmarked. A Very Good+ copy. Dustjacket has a repaired closed tear and wear to edges and is not price clipped. xiv + 583 pages. 45 illustrations. Jean Cocteau, who died in 1963 at the age of 74 after 58 years of kaleidoscopic activity in the arts, was a fascinating and paradoxical figure. With the astounding variety of his work - as poet, novelist, playwright, artist and film-maker (merely to begin at the top of the list) - and the contradictions of his private life, the charm and the nastiness, the generosity and the egotism, the poise and anguish of an opium addicted homosexual who was equally welcome in the aristocratic drawing rooms of Paris and the raffish waterfront bars of Toulon, and who crowned a life among the avant garde by entering the ultra conservative precincts of the Académie Française. He provides a rich and challenging subject for biography. Francis Steegmuller is admirably qualified for this task having written the definitive biography of Maupassant and many other biographies. PLEASE NOTE: A HEAVY VOLUME OF 1.37 KILO UNPACKED WEIGHT WHICH MAY REQUIRE ADDITIONAL SHIPPING COST 301. First Edition. Hard Cover. Very Good/Good. 8vo - over 7¾" - 9¾" tall. BOSTON: LITTLE, BROWN AND COMPANY. G/G DJ EDGEWORN, IN MYLAR WRAP. Pages: 583. . 1970. 1ST. HARDCOVER.. Condition: G/G DJ EDGEWORN, IN MYLAR WRAP. Pages: 583. Paris: Buchet/Chastel, 2003. Couverture souple. Très bon. In-8. 408 pages. Biographie bien documentée. Boston: Nonpareil Books, 1986. First Edition. Very Good +/No DJ. 8vo = over 9". First Printing Large trade paperback. Purple covers. Strong binding, very clean, some bumping to corners. Boston: Atlantic Monthly Press Book / Little, Brown and Company, . First Edition. Octavo (23.5cm. ); publisher's cloth in black dust jacket; xiv,,583pp. ; illus. in text throughout. Jacket with a number of long closed tears to extremities, the longest along top third of rear flap fold, some subsequent bubbling of lamination, very faint dampstain to top edge of cloth not bleeding into textblock, else Very Good in a Good only jacket. May not be noted.. Very Good with no dust jacket. 1970. First Edition; First Printing. Paperback. Poets; Authors; Playwritghts; THEATER; Movies; Film Maker; We fit archival quality clear acrylic covers for additional protection whenever possible. ; B&W Illustrations; Steegmuller, francis Cocteau Nonpareil Books Boston 1970" paradoxes of his private life, the charm the nastiness, the generosity and egomania, the poise and the anguish of an opium-addicted homosexual..." . London and Basingstoke: Macmillan & Co. Ltd., 1970. Hardcover in good condition. The upper edge of the jacket is a little creased and worn. Tiny nicks and abrasions to the spine ends. A few faint scores and general wear to the jacket throughout. Price clipped from the front inner flap. Traces of foxing to the head of the lightly marked text block. Previous owner's note penned on the FEP. The binding is slightly cocked. All text and images are clear. CM. Hardcover. Good/Good. Used. Atlantic Monthly. BLACK CLOTH. Steegmuller, Francis. Cocteau : A Biography. Boston: Atlantic Monthly, 1970. 1st edition. 583pp. Indexed. 8vo. Black cloth. Book condition: Very good with light rubbing to rear cover. . Very Good. 1970. Little, Brown & Co., 1970. Hardcover. Good. Disclaimer:A copy that has been read, but remains in clean condition. All pages are intact, and the cover is intact. The spine may show signs of wear. Pages can include limited notes and highlighting, and the copy can include previous owner inscriptions. At ThriftBooks, our motto is: Read More, Spend Less.Dust jacket quality is not guaranteed. see notes for publisher info. Used - Very Good. Great condition for a used book! Minimal wear. David R Godine, 1992-11-01. Paperback. Good. David R Godine Pub, 1992. Covers has crease at bottom right corner and light shelfwear elsewhere. Pages of text are clean, bright and free of markings. Binding is tight and secure. ***Ships today or next business day. Our books are carefully described and packaged in boxes (not envelopes). A gift card and personalized message can be included upon request.*** . Trade Paperback. Very Good. Little, Brown and Company. Used - Acceptable. No dust jacket. Very Good or better condition. Little, Brown, January 1970. Hardcover. Good. David R Godine. Used - Good. Former Library book. Shows some signs of wear, and may have some markings on the inside. David R Godine. Used - Very Good. Ships from the UK. Great condition for a used book! Minimal wear. 100% Money Back Guarantee. Your purchase also supports literacy charities. Little, Brown. Used - Acceptable. Acceptable condition. Book Very Good. No dust jacket. David R Godine. Used - Good. Good condition. Little, Brown & Co., 1970-01-01. Hardcover. Good. 9.4500 inches 6.2200 inches. Constable, 06/30/1986. Paperback. Used; Good. **WE SHIP WITHIN 24 HRS FROM LONDON, UK, 98% OF OUR ORDERS ARE RECEIVED WITHIN 7-10 DAYS. We believe you will be completely satisfied with our quick and reliable service. All orders are dispatched as swiftly as possible! Buy with confidence!